This band is known for its mind expanding sound. Ethnic, Pre-industrial and contemporary influences are blended to create an unique style that has influenced many who were looking for spiritual dimensions. 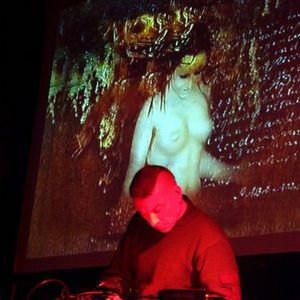 In the beginning of the 80's, Magthea, the male side of the HYBRYDS was involved in The Klinik, in the mid 80 's he worked on his own personal music style. Based on ancient influences and modern technology, the first tape demo: ?Mythical music from the 21st century? (1986 - 3RIOART) did not get any reaction in the music scene. ?Octahedron? (3RIOART) a limited 7 inch followed but again no one was interested. At the start of the 90's Yasnaia joined the HYBRYDS concept adding her clear vocals and acoustic instruments. Working together with Djen Ajakan Shean and Vidna Obmana resulted in the first of many CD releases: ?The ritual should be kept alive part 1? (1991 - 3RIOART). An ethnic styled trance piece. Suddenly the music scene discovered the original, eclectic and powerful HYBRYDS sound. Many CD releases followed, each release covering an aspect of the path Magthea and Yasna?a were walking. ?The ritual should be kept alive part 2?, contained collaborations with other musicians and remixes of the first demo tape. In ?Music for rituals" (ARTWARE) the pure magical sound of HYBRYDS became reality, a struggle between female and male energies gave birth to one of the most original releases in the magical music scene. ?Soundtrack for the Aquaria of the Antwerp Zoo? mysterious deep ambient music created with Ah Cama Sotz for the 150th anniversary of the Zoo (1993). ?The ritual of the rave? (DAFT) was their answer on the commercial rave scene, the soundtrack of the rave of their tribe and ?The atavistic Fetisj? (3RIOART) an industrial mini CD were the next steps in their evolution. Each release different from style, yet it is HYBRYDS. ?Dreamscapes from a dark side? (DAFT), their most dark and deep ambient masterpiece, was the reflection of 5 years studio work. A CD so strong and intense, covering the descending to the black caves of your mind, a trip in your personal subconsciousness where all your fears are born. Although many think ?Cortex Stimulation? (DAFT) and Mistrust Authority (vinyl on SOMETHING WEIRD) is a break with their musical past, Hybryds themselves label this project as cyberpunk, all the elements which makes HYBRYDS so unique, are still there. Industrial rhythms and hypnotic electronic sound that crawls into the brain and brings the listener in alternated states, this time not with ethnical techniques but with LO-TEK technology. ?Tectonic Overload? (1997 - ANTZEN) a limited art release goes on and over the edge of industrial music, dead-techno influenced rhythmtracks and hypnotic industrial noise brings HYBRYDS closer to the dance floor of the madman. Each release being accompanied by spare live performances, these cyberpunk releases gave birth to their new live project: MISTRUST AUTHORITY - PROMOTE DECENTRALIZATION, dedicated to all LO-TEKS (and William Gibson), in their fight against political and religious suppression. A project dealing with the media, virtual reality and the future of the human race. This time they took the meaning of industrial a step forward. This project balances on the edge of tolerance. Extreme, structured sound, frequencies that goes straight to the brain. Backupped with a lo-tek cybervideo and blended with the mystical and emotional vocals from Yasna?a, the noise evokes trance. Trance evokes spiritual dimensions. ?Virtual Impact? (2000 - DAFT) the provisional latest HYBRYDS release contains an excellent selection of this powerful live sound and a live recorded videoclip (made by the Stubnitz crew). As contrast in the HYBRYDS apocalyptic live gigs, Yasna?a brought her solo project live as a dark, ethnical and more ambient show. A video based on her dreamscapes and slide projecting creates the athmosphere for floating and soft danceable rhythms and her esoteric vocals brings you in a sensual dream state of mind. All these reflections you can find in the first CD ROM release of HYBRYDS; (vuz) An immense collection of artwork, video, digital poetry and information of 16 years of HYBRYDS existance, available for Macintosh OS9 and Windows 98. When Yasnaia left the HYBRYDS project in 2000, Magthea went on with studio projects, video, digital photoart and audio-visual livegigs. And a new female singer/musician: Madeline Arndt. 2007 DREAMBIENT: New audio-visual live project with Schattekindern female vocalist, Madeline and Morbid Butcher guitarist, Sven.